There will always be some humans who say they have ‘the right’ to take drugs. Perhaps they do. Perhaps they don’t. Which is it? One thing is certain, when a person claims ‘It’s my body, I can do what I like with it,’ there is a flaw in their reasoning. One can see, straightaway, there will be (or should be) several other persons involved in our lives who would wish it that we take care of the body we have or are. My aunt is rapidly dying from lung-cancer and I would prefer that not to be the case. If drug-taking is wrong, what makes it wrong? This is easier to answer if the drugs taken are illegal. One could find sanctuary within the walls of the law. But that’s far too easy, and dangerous. Who wants to be left holding the logic which states if something is legal it is morally right? Not me, thank you. Then again, who wants to argue drinking caffeine is morally wrong? I am happy to be corrected here, though I remember reading that, on a chemical level, nicotine breaks down caffeine and a person recently free from cigarettes should also cut their coffee intake because without nicotine, the caffeine has a greater affect on their brains. The affect might be greater irritability, insomnia or restless sleep – the affects of caffeine are well known, yet their affects are not considered a moral problem. Why not? Caffeine, the common name for trimethylxanthine, is a drug, a chemical a person freely ingests which has affects upon their brains they might not experience if they didn’t take it, yet it gets a free pass from any moral questioning. That free pass could be because of the affects themselves. Ingest enough C8H10N4O2 and you might be less calm, but unlikely to be up for a spot of the old ultra-violence because of the mixture of carbon, hydrogen, nitrogen and oxygen you just ingested. We all consume chemicals which are unnecessary for survival, so if taking illegal drugs is wrong, I doubt it’s wrong because they’re illegal; taking them is wrong because of their affects and it’s the affects which make them illegal. It’s a small point, but it’s one which filters coffee and cola out of an argument they should not be in to begin with. The moral questions come about, Peter Hitchens writes, when the affects of the drugs taken stupefy the taker into incoherence or dangerous behaviour they would not otherwise indulge in. This argument tends to bring up the question of alcohol. If booze is legal and is the cause of sickness, murder and other kinds of death – then why should certain drugs, especially cannabis, remain illegal? It is to his credit that he uses humour this way. It might be a sign his arguments are so obviously sound that he can afford to inject a little humour here and there. A person could be forgiven for expecting a sermon or a bossy lecture from the chap. 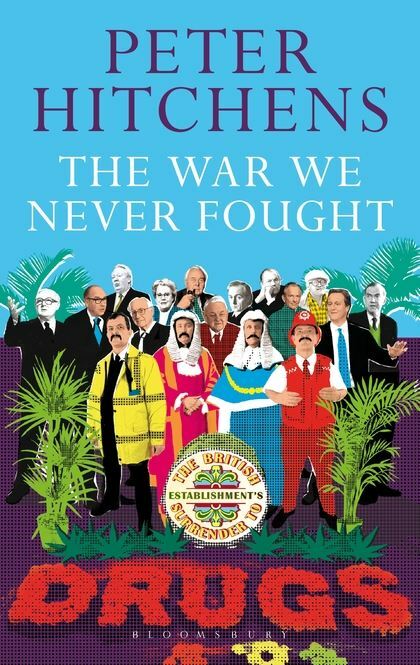 No doubt Hitchens is capable of that, but he doesn’t do it in this book. That is a fair example of the book’s tone or style. You get simple, logical arguments, offered using plain English as their delivery system. Splendid. Well, quite. My eldest son has been far too fond of cannabis for some years and his behaviour when smoking the stuff is upsetting. He can be obnoxious, paranoid, needlessly argumentative, downright abusive and sometimes violent. During the periods he doesn’t smoke the garbage his behaviour is significantly different. Nothing else he ingests seems to have this effect on him. Without the example of my eldest son I might well shrug my shoulders and fall-in with the crowd who make the ‘what about alcohol?’ point, but I cannot. And I know my son’s mother has, many times, been anxious that he stop smoking it. My interest is declared. I have never been fond of this country’s political class, at any level, from Westminster to ‘my’ local councillors. It is my belief they are – all of them – entitled to no privacy whatsoever and every aspect of their lives is a legitimate target for public scrutiny and press intrusion. I should like to know what they do, where they do it and with whom, and how much of my money they spend doing it. (I have a good friend, a psychiatric nurse based in Cardiff, who told me he and his colleagues had been out on the town, more than once, on ward funds. Another friend, a finance officer in a school told me that, many times, school funds had been used to throw leaving parties for teachers and to buy presents for them and so on. Hardly is this Watergate, but it is significantly irritating.) Yet those politicians who are (possibly) not corrupt in that sense – don’t feather their own nests – but ‘tinker’ with the laws and carry out their social experiments on the rest of us, are perhaps worse than the politician who rakes off a few quid. Some of the characters within Hitchens’s pages – and not all of them politicians – are guilty of poisoning society in a sense. They might not have meant to do it, yet that says nothing about what they actually did do. You’ll have to read the book yourself. The next time (if there is a next time because he seems to have sorted his life out at the moment) my eldest son punches holes in a bedroom door while his younger brother and sister are watching, I might invoice Paul Mcartney for the repair.